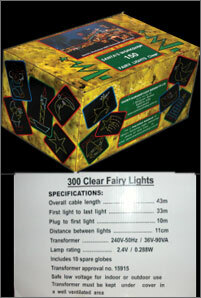 Santa's Workshop fairylights are sold in boxes of 150 and 300 clear light strings including 5 spare globes for the 150 boxes and 10 spare globes for the 300 boxes. We also have 300 light strings without transformers. Please inquire if you would like more information.